Rias Gremory, Asia Argento, and Akeno Himejima- High School DxD (Rias Greeley has the looks and the way some things are presented within her family suggest that. Asia has the looks for it as well as the name. Akeno Himejima’s dad, Baraqiel has a Hebrew sounding name. Rin Tohsaka, Sakura Matou, and Luviagelita Edelfelt (the Fate franchise)- Edelfelt is a Jewish-sounding surname and the Tohsaka and Edelfelt families are related. Seras Victoria (the Hellsing series)- Her first name is derived from the angel Seraphim. Her last name also indicates that she is of Sephardi Jewish descent. Rias Gremory, Asia Argento, Akeno Himejima, Ravel Phenex, and Raynare (High School DxD)- Rias’s looks, name and the other names of several of her relatives give this away. Asia’s name also gives this away given who she’s named after. Akeno’s dad, Baraqiel has a Hebrew name. Ravel’s name also gives this away too and same goes for Raynare. Lutz, Mildo, Amalia Torohovsky, and Hex (Jormungand)- Lutz’s name indicates this. Mildo’s looks also suggest this. Amalia’s surname and Hex’s name also suggest this too. Seryu Ubiquitous and Wave (Akame Ga Kill)- Seryu’s surname indicates this. Wave’s name also hints at this too. Bayonetta (Bayonetta)- Her real name suggests this and so does her mother’s. 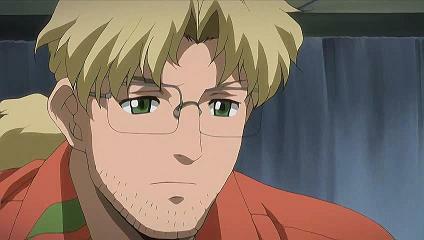 Henrietta (Gunslinger Girl)- Her name and looks suggest this. The Goldschmidts (Blood+)- Their surnames and the fact that they’re based on the Rothschilds give this away. About the Luviagelita Edelfelt part, the surname also indicates Ashkenazi Jewish ancestry. Waver Velvet (the Fate franchise)- His name and looks suggest this. Kalawarner, Dohnaseek, Mittelt (High School DxD)- Their names suggest this. I also forgot to mention Bennia from High School DxD and Serafall Levithan from High School DxD due to their names. The same goes for Lua Klein and Nice Holystone from Baccano along with Amber from Darker than Black due to their names. I am really baffled by your claim that all these characters are Jewish based on name alone. Almost none of these are even close to Ashkenazi or Sephardic Jewish names, let alone Mizrahi names or those from non-European Jewish cultures. I think that Klein is the only one that I’ve ever actually seen in the Jewish communities I’ve been involved in. I really hope you don’t assume people are Jewish based on names (or looks, especially not looks) like these in real life because I think you’d be wrong most of the time. Sorry about that. I tend to get confused with these sorts of things. I mean no harm. I also forgot to mention Issac Ray Peram Westcott, Ellen Mira Mathers, Elliott Baldwin Woodman, her sister Karen Nora Mathers, Minerva Riddell, Artemisia Bell Ashcroft, and Jessica Bailey from Date A Live judging by their names. Other characters I forgot to mention are Sebastián Michaelis, Claude Faustus, Hannah Annafellows, Timber, Thompson, Canterbury , Ash Landers/Angela Blanc, and Grelle Sutcliffe from Black Butler due to their names and looks.